To spend at fatface.com just select the ‘Pay with a Gift Card’ option at the online checkout and enter your Gift Card number and PIN. To spend in-store, present the digital gift card bar code to be scanned at the till. It’ll work straight from your mobile or you can print it out and use a paper copy. You won’t need your digital gift card PIN in store. 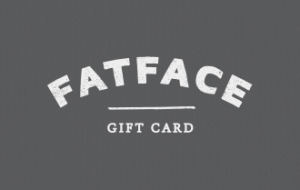 Your FatFace digital gift card is valid in any UK FatFace store or online at fatface.com. You can use it as full or part payment for FatFace kit in participating stores, at fatface.com and also via our call centre on 0330 124 0000. If you’d like to check the balance of your FatFace digital gift card, visit the crew in store or give us a call on 0330 124 0000. Your digital gift card is valid for 24 months after your last transaction (which includes balance enquiries). After this it will be taking a well earned rest and any outstanding balance will be cancelled. Your digital gift card is valuable, so treat it like cash. If your digital gift card gets lost, stolen or damaged FatFace can’t replace it, so look after it.